For those who prefer a greater cake-to-frosting ratio or for those who want a more rustic, earthy look, we have naked cakes! What’s a naked cake you ask? It’s a pared-down creation of cake without an outer layer of frosting. You can see the texture of the cake and color of the layers inside. It’s a great way to showcase organic ingredients. Let what ever season you are in influence what flavors you want to use. Add some fresh fruit or drizzle some jam over the top. It so universal so you can use whatever you fancy. I personally am a frosting-holic, yes, my name is Ashley and I have a serious frosting addiction. I still love cake and this one is light and has just the amount of sweetness I like. I like to make this cake around Valentine’s Day because of the use of Cherries and my sweetie happens to adore chocolate cake. Win, win! Enjoy! Make the cake according to the desired instructions. Bake in either two 8- inch or 9-in round cake pans. Let the cakes cool entirely. In your electric mixer, beat the cream, sugar and almond extract in a large bowl until stiff peaks appear. Drain off the cherries and place them in a separate bowl. Use a serrated knife to cut the cakes in half horizontally. Place one layer of cake, cream and then cherries. Repeat with the rest of the layers. 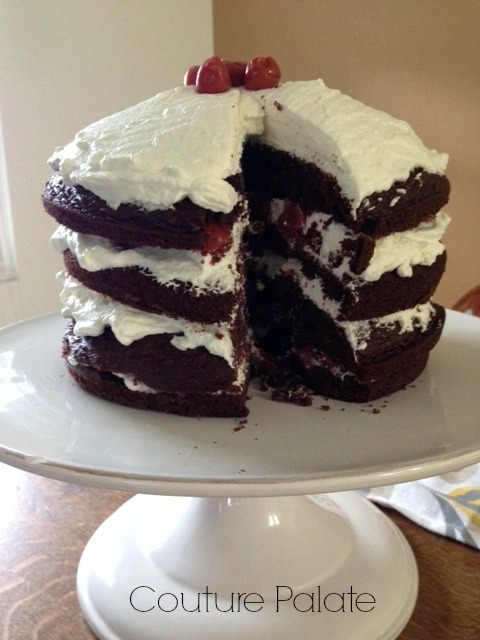 Top the cake with whipped cream and a couple of cherries.